This month’s ‘Picture This’ welcomes new team member, Dr Robert Gallagher (Lecturer in Medieval History, University of Kent), with an image from a wonderful Book of Hours in Canterbury Cathedral Library (H/L-3-1) that reveals a classically dark tale of love, betrayal and revenge. The opening image alludes to the legend of Hercules, who shot the Centaur Nessus with an arrow poisoned with Hydra blood because the centaur tried to carry off Hercules’s bride, Deianira, rather than ferrying her across the river. With his dying breath, Nessus bade Deianira to take a phial of his blood as a love potion to bind her husband to her. 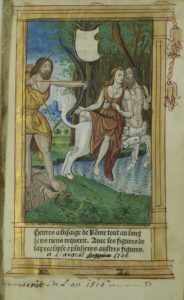 When Hercules took up with the nymph Iole, Deianira anointed her husband’s shirt with the centaur’s blood; she had not realised (as Nessus certainly knew) that it too was poisoned from the toxic arrow and would kill Hercules. On learning of her husband’s death, Deianira committed suicide, but following his death Hercules joined the gods. This full-page miniature, full of light, shade and movement, set in an Arcadian scene, uses gold to highlight the importance of Hercules (with a lion’s paw at his waist) and also his bride’s costume. In terms of composition, the hero’s bow guides our sight to the centaur Nessus whose bearded face resembles Hercules. Like Nessus the Centaur, this Book of Hours is a hybrid. Jayne Wackett discussed in an earlier ‘Picture This’ (December 2012) how this beautiful book is ‘a fascinating example of the co-existence of print and manuscript’; it has been printed on vellum and typeset in a Gothic script to appear as close as possible to more traditional, and more expensive, manuscript Books of Hours. Yet Horae, or Books of Hours, were prayerbooks for wealthy laypeople’s daily devotion. So why would Greek mythology feature so prominently in such a highly devotional book? The explanation involves two brothers, a Parisian publishing house and a love of Italian Renaissance at the French court. In the early years of the sixteenth century two brothers, Gilles and Germain Hardouyn, produced in Paris hundreds of printed Books of Hours. Gilles was the publisher and Germain was a fine illustrator who later printed and published under his own sign. Between 1509-1529 Gilles’s workshop was at the end of the Notre Dame bridge ‘at the sign of the golden rose’, and from the almanac included in the opening pages we know this book was printed around 1516, as a former owner has indicated at the foot of this folio. Some of Gilles’s metal engravings had originally been designed by Jean Pichore (fl. 1500-1520, Paris), perhaps the most well-known illuminator and engraver of the period. Pichore replaced the highly-structured Gothic designs of printed prayerbooks with new Renaissance designs; for example, he used geometric perspective and lighter blue/green toned backgrounds, often dotted with Vitruvian ruins (a classical theme to which Stuart Palmer alluded in December 2018’s ‘Picture This’). Perhaps Pichore imbibed these classical ideas from his patron Cardinal Georges d’Amboise, who built up a humanist library in his Renaissance palace; doubtless the Cardinal’s patronage allowed Pichore to gain access to the French court. Gilles Hardouyn’s printed Books of Hours with lavish hand-painted illuminations of these new engravings allowed wealthy Parisians a form of visual access to Renaissance court culture. These allusions to courtly and classical culture might be why Gilles Hardouyn’s ‘device’ was the decidedly secular scene we see in this image. It was an instantly memorable illustration and an excellent method of ensuring his books were easily recognised in the competitive world of Parisian printers. 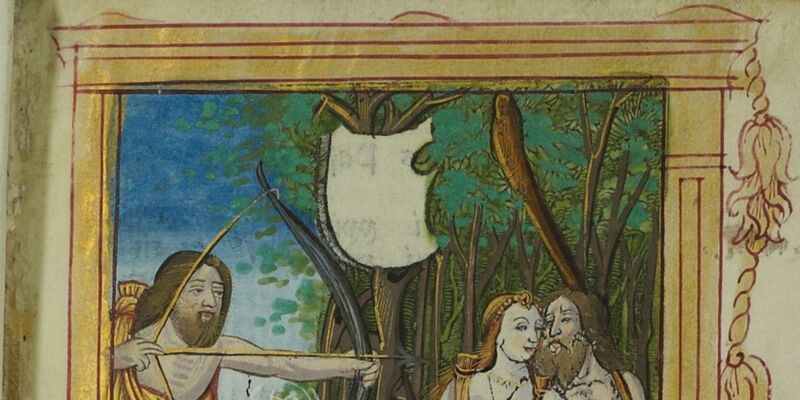 Passionate Hercules loosed his arrow and sealed his fate, a cautionary and resonant tale.